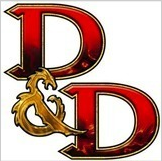 That, or everybody involved in the playtest of DnDnext secretly wants to be playing Dungeon Crawl Classics RPG. Judging from the most recent Legends and Lore column, players want more options for the fighter than just attacking, like tactical options such as tripping or grappling. I’ve got a crazy idea, (actually Joseph Goodman did): why don’t we allow fighters to try anything they can imagine, and assign a die roll to decide whether they can pull it off. That would encourage both creativity and roleplaying in what traditionally is the easy, if boring role to play. The Warrior Mighty Deed of Arms system does exactly that. If you’re a Warrior or a Dwarf in DCCRPG, whenever you roll an attack, you roll your deed die. The deed die increases in size as your character levels, making the deed easier to pull off, or its effects more brutal! It also adds to your to hit roll, and damage, making more impressive feats more likely to hit and score a devastating blow. Its a great way to take what could be a very limited class and give it nearly limitless options, which is really a great advantage table top roleplaying has over MMORPGs, and video games in general. For my next trick, I hope all the play test responders complain about the magic system, and how it just doesn’t feel magical anymore. The way DCCRPG handles magic is truly awesome, and brings back some of the mystery and danger of dealing in forces beyond the knowledge of mere mortals. I’ve been saying it for months, but hopefully more people are catching on. Want to play an awesome roleplaying game with all the grit and lethality of the old school, but some of the sophistication that comes from decades of experience? Play Dungeon Crawl Classics RPG. Your next edition is waiting for you right now. 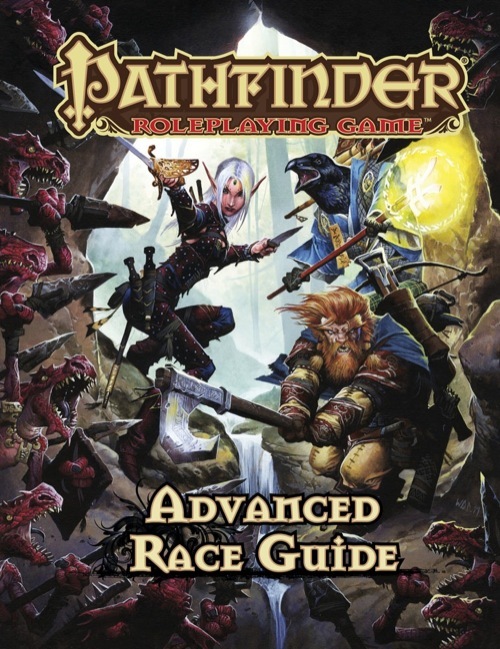 The Advanced Race Guide is an excellent resource for two of the main types of players: min/maxing power gamers, and character-concept gamers. Most of us don’t fall squarely in either camp, but usually have tendencies towards one type or the other. This book is full of options for not only the core races, but some more exotic races like Catfolk, Dhampirs, Tengu, and Aasimars, and also the truly weird like Merfolk, Svirfneblin, Gripplis, and Kitsune. There are many, many more; some I recognize from other game systems or myths and legends, some that are entirely new to me. Choice is where this book really shines. For the character-concept type of gamer, there is an amazing variety of different races with different traits and backgrounds, (not to mention some amazing illustrations) that can really get your creative juices flowing for those looking to create a truly memorable character. For those who prefer devastating combat efficiency to catch-phrases or gimmicks, this book has a plethora of options to tweek your PC into the epitome of whatever role you have chosen: Dwarves so in-tune with the earth and rock they can call upon it to aid in their attacks (Stonelord Paladin), Elves so connected to nature they can become part of the forest (Treesinger Druid), and of course, nothing can go wrong when you give a Gnome a gun (Experimental Gunsmith). Maybe that last one belongs with the character guys, as Gnomes with guns sounds like more of a comedy than an action hero. There are also tons of traits that can be swapped out from the old ones everyone has memorized from the core rulebook. Also equipment, magic items and feats from each of the races representing their culture and place in the Pathfinder world. There is even a section at the back where you can use a point-buy system to create your own race for your own world. Say your party has traveled to a plane of clockwork monkeys. You can design an entire culture around them with some modicum of game balance. Ultimately this is a pretty solid buy for GMs and players alike, but you’ll want to run it past the GM if you plan on introducing a new Wyvaran (Half-kobold, half-wyvern) sorcerer to your next game. If you’re tired of the tried and true archetypes and are looking for something truly off-the-wall, this is your book. If you are new to Pathfinder, or are already daunted by the vast number of options available in the Core Rulebook, Advanced Players Guide, Ultimate Combat and Ultimate Magic, it may not be a must-have. Something I’ve always wanted to run is a monster-PC campaign, in which each player is chosen as a champion of their race to assault a human settlement and drive civilization out of their monster warrens. The party would be made up of a Goblin rogue, Kobold alchemist, Orc barbarian, Gnoll sorcerer, and maybe a Hobgoblin cleric. This book is the perfect resource for that sort of thing. What an incredible day of gaming. I’ve participated in three free RPG days in this town, and the other two didn’t hold a candle to this year’s day. Our newest and most friendly local gaming store, The Wyvern’s Tale, decided to have their grand opening coincide with free RPG day this year. This was a fantastic choice on their part! The turnout was higher than I had ever seen at one of those events, and rather than people just snagging free stuff and retreating to their underground lairs to roll dice in the dark, there was constantly 3 to 5 games going on during the entire event! Pathfinder was by far the most common, but people were also playing Fiasco, Monsters Monsters, Hackmaster, DCCRPG, and I think there might have been some warhammer going on. I had met the owners at GeekOut 2012, and they were really excited to see how many players and how many games were happening in the gaming room at that event. At that point, they were still in negotiations with a location in west Asheville, but the one they chose on Merrimon is one of the best gaming spaces I’ve ever seen. It’s essentially just a big old house, but it lends itself perfectly to gaming. The lower floor is all retail space with tons of boardgames, dice games, a magazine rack used to display RPG books, and a snackbar/register area. The upstairs of the house is all bedrooms that have been converted to gaming spaces! The main room has three tables, there is a wargaming room that has tables you can walk around and some terrain, and another bedroom with two smaller tables. There were many times in the day in which 5 games were going on at once! Rare is the FLGS that can pull that off. Free RPG day is all about recruiting new players. We like to start them young. 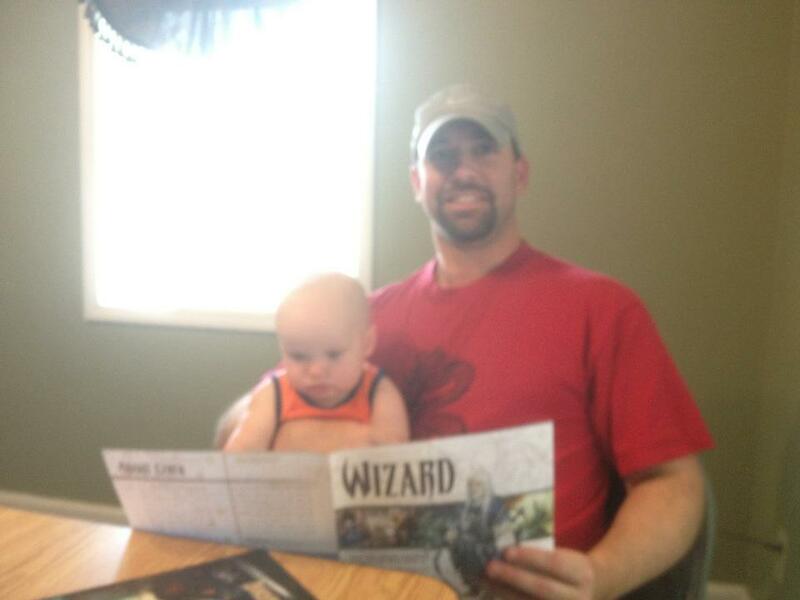 This is our newest wizard in training! Needless to say, the Asheville Pathfinder Lodge has found it’s new home. In fact, we’ll be meeting there this Saturday the 23rd at 5pm. If you’re in anywhere near the Asheville area and want to get in on some Pathfinder organized play, come on by and check out the best gaming store in western North Carolina! MultiverseAVL has some great pics of the Grand Opening/Free RPG day here. It was awesome. I can’t wait until next year! On a side note, Comic Envy is organizing Asheville Comic Expo (A.C.E) for this October. I’m going to do my best to make sure there are some gaming tables going on at the event. If you like comics and gaming (and you probably do if you’re reading this) give them a like on facebook and keep an eye out for the next big gaming event in our region! Free RPG Day is less than two weeks away! For the uninitiated, Free RPG Day is a magical day similar to Free Comic Book day, except that Free RPG Day is sponsored by Friendly Local Gaming Stores to encourage gamers to come out into the glaring light of the sun and pick up some awesome free stuff. While you’re there, you might as well see what else your FLGS is offering these days and maybe make a purchase or two to encourage them to continue to participate in this awesome event! Our supremely awesome and brand new Asheville FLGS the Wyvern’s Tale will be hosting festivities starting at noon on Saturday, June 16th. This magical day will also be their grand opening! 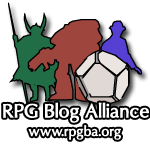 I offered to run DCCRPG, and there should be some Pathfinder games, and maybe even Fiasco. There is a ton of free loot to be had, but in the spirit of the day, why not stay and play awhile? We’ll be having a blast at the Wyvern’s Tale, but if you can’t make it to Asheville, find the nearest retailer near you, and show your support for your Friendly Local Gaming Store and RPGs! 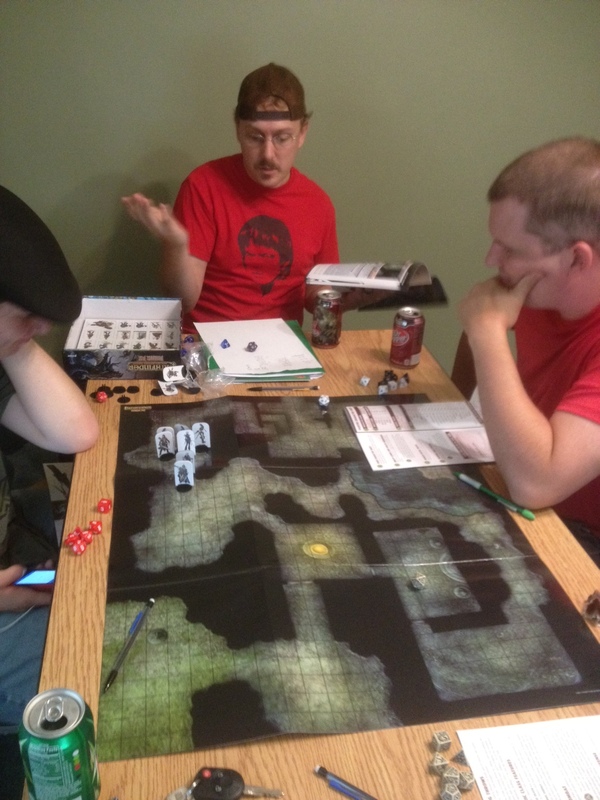 The memorial day holiday offered the perfect opportunity for some of the Skyland Games guys to give this DnDnext Playtest a whirl. We were all pretty eager to see how the various mechanics would work out in play, and encouraged by the old-school feel of the character sheets, and the provided adventure: Caves of Chaos. Adding to the old-school motif, we had seven PCs in the party, (something we would normally avoid at all costs in 4e) but it didn’t bog down the action as much as large parties have with other editions. Once the players were accustomed to their character sheets and equipment, the turns moved pretty briskly for such a large party. We had all of the pre-gens represented, while we doubled up on the elven wizard and the thief. We also had a fairly even split of guys and ladies playing (4 guys, 3 ladies). Scott suggested we tap in to the DCCRPG core rulebook for some names and titles to give these guys a little individuality. For those of you unfamiliar, at the back of the DCCRPG book, there are two Appendices that are percentile tables in which you can roll up a name and a title based on your class. From these we derived such awesome names as Naroob the Chaste, Thremnym the Killer, Scarabus the Mystic, and Llambichus the Paladin among others. Its a fun, simple way to add a bit more flavor and individuality to your character; especially fun with pre-gens. Overall I think everybody had a really good time, and this version of DnDnext seemed to lend itself to more creativity and improvisation at the table, something many of us feel 4e usually lacks. Its not that you can’t improvise in 4e, just that most players tend to bury their heads in the 5-10 pages of their character sheet to look for a power, rather than consider the situation and try and make something up. I just received the first email from WotC seeking feedback from the playtest. Hopefully we’ll be able to play it more in between games of DCCRPG and Pathfinder. Speaking of which, last night was the second session of our pirates campaign and the Skulls and Shackles adventure path! (Minor spoilers ahead) At this point we’ve been on the boat for about two weeks, and have been working on gaining some allies from within the crew. The officers of the ship clearly think we’re up to know good, and they’ve started to make sure they have some allies as well. By the end of the session, only one crew member was still on the fence between the groups, and the crew was pretty evenly split. Methinks the waters ahead may be choppy! It has been an awesome experience so far, and a refreshing change from the bite-sized adventures in Pathfinder Society. The only thing that has been a bit confusing so far is keeping track of the NPCs! There are about 30 crew members and all of them have a little back-story. It’s a very richly detailed module. 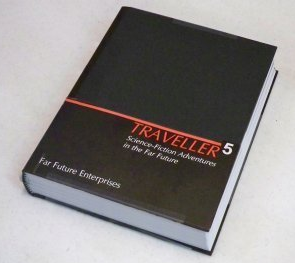 In other news, Marc Miller, the original creator of Traveller has launched a kickstarter to get the Fifth Edition published! You didn’t think D&D was the only 35 year old game working on reinventing itself, did you? I personally really like Traveller, even though I have played very little of it. Instead of three little black books of the original, Marc is raising funds to publish a massive 600-page core rulebook. I think I’m going to need to own a copy of that! According to the kickstarter page, a lot of updates have been made in terms of technology levels, robots, computers, ships, and just about all the aspects that makes Traveller, Traveller. I’m really looking forward to it, and hope they’ve got some great artists on board to fill those 600 pages with more than just text. With all these great systems to play, it may be awhile before we can get back to Traveller, but when we’re ready, hopefully there will be a 600 page tome waiting for us.